The University of Manchester has launched an ambitious new lawtech project that brings together academics from its schools of law, business and computer science with corporate law firms Freshfields and DWF. The collaboration, badged ‘The Manchester LegalTech Consortium’, has dual research and teaching aims. On the research side, it aims to pool ideas across disciplines to come up with new lawtech applications that can be used in practice to boost the efficiency of the legal profession. Freshfields and DWF will provide an arena to trial what the boffins come up with. Teaching-wise, Manchester Uni will bring in Freshies and DWF lawyers, alongside business and computer science academics, to deliver the new lawtech and access to justice module it is developing with legal technology company Neota Logic. There’s also a wider brief to contribute to public policy debate on innovation in law. This may see ideas offered about content for the new solicitor super-exam that is set to replace the Legal Practice Course (LPC) in 2020, although a question about this by Manchester University Professor Claire McGourlay at the unveiling of the project last night at DWF in Manchester did not elicit a conclusive response. Also at the launch was Ministry of Justice big wig Lord Keen, who spoke about his high hopes for what the cross-disciplinary teams might achieve, as he backed a legal profession tech revolution. 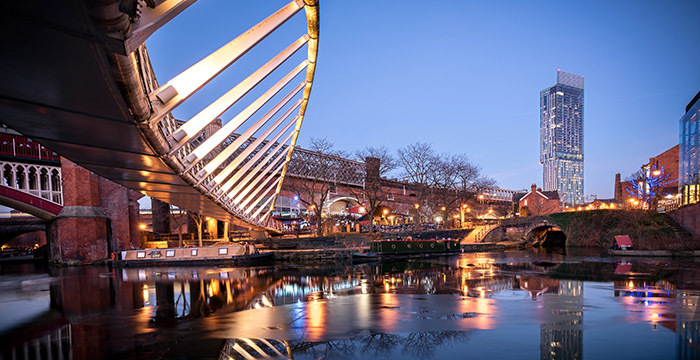 Manchester is becoming something of a legal IT hub, with Freshfields and DWF among a host of firm’s which have embraced innovation in the city. Addleshaw Goddard and Pinsent Masons are other tech leaders — each scoring an A* for tech savvy in this year’s Legal Cheek Trainee and Junior Lawyers Survey — which have large bases in the city. Hear more about what Manchester University, Freshfields and DWF are doing at the Legal Cheek Future of Legal Education and Training Conference 2019 in May next year. I’m not paying £180 + VAT to hear more about this. Tax the robots and software to pay for teachers pensions!! I’m voting for Jeremy Corbyn to redistribute wealth and express solidarity with refugees!! FOR THE MANY, NOT THE FEW!!! Jeremy will rebuild Britain! For the many, not the few! This is a very exciting move for Freshfields; coming closer to a well-established firm in Manchester after its initial launch. This will enable both Freshfields and DWF to test the waters regarding an indirect coalition in the hope of a future merger under the brand DWFields. Will all tanks be realigned, so all the senior partners at DWF will be happy becoming associates then?